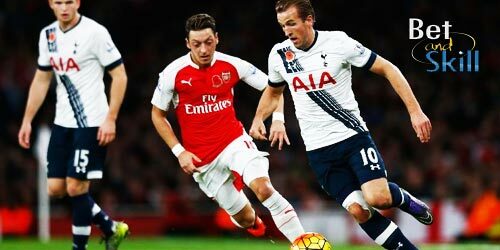 Arsenal host Tottenham Hotspur at the Emirates Stadium in the first North London derby of the season on Sunday. This article contains our Arsenal v Tottenham betting preview, with predictions, betting tips, starting line-ups, team news, best odds, bookie promotions and no deposit bonuses on the match! Arsenal have picked up 7 wins and 2 draws since their matchday 1 defeat to Liverpool. They sit second on the league table with 23 points. They showed great spirit to come from 2-0 down to defeat Ludogorets 3-2 in midweek with the exceptional Mesut Ozil scoring a stylish winner, meaning that they have won 12 of their last 15 competitive outings. Anyway, just three points separate the two clubs in the table, following the Gunners' 4-1 rout of Sunderland last weekend. Arsene Wenger is hopeful that Hector Bellerin will be fit to play. Theo Walcott, Santi Cazorla, Nacho Monreal and Kieran Gibbs are all doubts. Aaron Ramsey may keep his place in the side, with Alex Oxlade-Chamberlain dropping to the bench. Up front, Alexis Sanchez is expected to lead the line but the Chilean could also play as offensive midfielder, with Olivier Giroud deployed as central forward. The likes of Per Mertesacker, Danny Welbeck and Lucas Perez remain out. Tottenham are in the midst of a six-match winless run, losing two. They remain unbeaten in the Premier League after 10 games this season but enter the North London Derby on the back of a 1-0 home loss to bayer Leverkusen in Champions League. Spurs have managed back-to-back draws in their last two visits to the Emirates. But Arsenal are unbeaten in their last 6 home games against Spurs in all competitions, with 4 wins in a row behind the 2 draws. Mauricio Pochettino has confirmed that Harry Kane is back in the squad and the striker is expected to spearhead the attack, with Vincent Janssen as alternative. Son Heung-Min, Dele Alli and Chistian Eriksen are likely to play behind the England international. Moussa Sissoko serves the third of his three-match ban while Erik Lamela and Mousa Dembele are both doubtful. As to the defense, Danny Rose was rested in midweek and should start at left-back, with Kyle Walker continuing at right-back and Eric Dier stationed alongside Jan Vertonghen in the absence of Toby Alderweireld. "Arsenal v Spurs predictions, betting tips, lineups and free bets (North London Derby - Premier League - 6.11.2016)"